MENOMONEE FALLS, WI (June 27, 2017) – McDermott Cue Mfg., LLC, a leading manufacturer and worldwide distributor of billiards cues and products, has recently announced the release of a new line of cues designed especially for carom. The new line of Carom Cues features over 60 popular McDermott cue designs that have been tailored to meet the specifications for carom. This includes the cue being two inches shorter, a smaller tip diameter and a straight taper. Competitively priced starting at $285, these cues are made in the USA and are built to meet the same superior quality standards that customers have come to expect from McDermott. Many of the new cues feature McDermott’s high-performance G-Core and i-Shafts. McDermott has been producing high-quality pool cues in Menomonee Falls, Wisconsin since 1975. “McDermott employs some of the finest engineers and craftsmen to produce our products. As we have seen the game of carom grow in popularity over the past few years, we believe it is important that we provide quality cue options to carom players worldwide,” said Greg Knight, owner of McDermott Cue. Mazin Shooni, President of the US Billiards Association (USBA) and professional carom player, is excited to see McDermott step into his favorite game of carom, not only with the additional line of carom cues, but also with their sponsorship of the USBA. “With McDermott’s expansion into carom cues, more players will be drawn to the game and it will grow both in quality of equipment and expertise of players,” said Shooni. 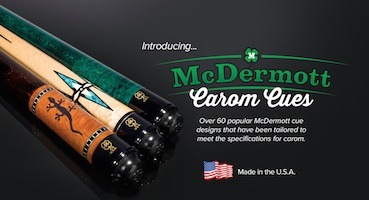 McDermott’s carom cues are available for purchase on McDermott’s website at www.mcdermottcue.com/carom.